WASHINGTON, July 22, 2013—Africa is home to nearly half of the world’s usable uncultivated land, some 202 million hectares that can be brought under the plow. Yet it has the highest poverty rate in the world. The continent’s poor development record suggests it has not leveraged its abundant agricultural land and natural resources to generate shared and sustained growth. A new World Bank report “Securing Africa’s Land for Shared Prosperity,” released on July 22, argues that poor land governance – the manner in which land rights are defined and administered – may be the root of the problem. The report offers a series of 10 steps for improving land governance that can help to revolutionize agricultural production and end poverty in Africa. With political will from African Governments and support from development partners, the plan to improve land governance in Africa in a decade could cost as little as US$4.5 billion. The report lays out land reform pilots in Malawi, Benin, Burkina Faso, Ghana, Mozambique, Tanzania, Uganda and other countries and shows how many countries in Sub-Saharan Africa have recognized customary land rights and gender equality, the two key issues that provide a basis for sound land administration. The 10 steps are based partly on lessons learned from agricultural land reform movements in Brazil and China and land rights reforms in slums in Argentina and Indonesia. The steps are tailored to reflect experiences with land reform pilot projects underway in African countries. Securing tenure rights for community lands and individual plots. Increasing efficiency and transparency in land administration services by empowering local communities and traditional authorities. Developing capacity in land administration by encouraging policy reforms and providing training. 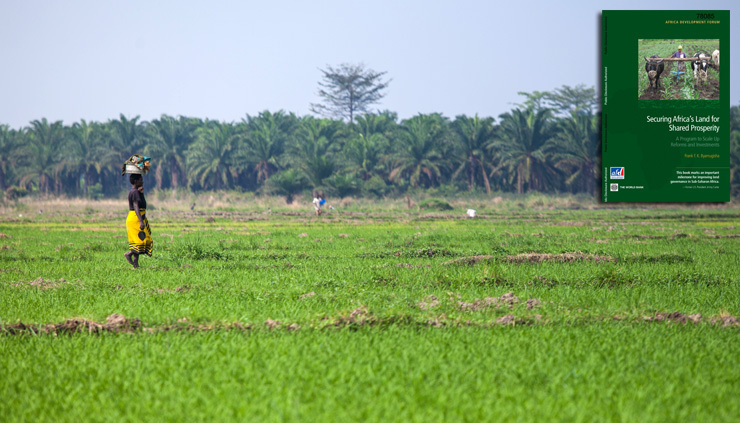 Over the last decade, pan-African organizations and African countries have made strides in establishing land policy initiatives and piloting innovative approaches to improve land governance. Despite the determination and effort of leaders to improve land governance, serious challenges must be addressed. Land grabs by investors have already claimed millions of hectares, in some cases pushing established communities off the land. Yet, the report argues, now is a good time for governments to begin scaling up land reform. Surging commodity prices and strong foreign direct investment; established regional and global initiatives for land reform; and new laws to reform land rights and provide gender equity have set the stage for large-scale land rights progress. Many countries are taking advantage of new technologies such as satellites that have the potential to reduce the cost of land administration, the report notes. At least 26 countries in Sub-Saharan Africa are replacing their geodetic infrastructure with low-cost global positioning systems for conducting uniform, cost-effective surveys. And at least 15 countries in the region have ongoing initiatives to computerize their land registries, key for improving efficiency and reducing costs and corruption. The report highlights Malawi’s redistributive land reform program as a good model on which other countries can build to address landownership inequality and landlessness. In 2004, with support from the World Bank, the government of Malawi instituted a decentralized, voluntary and community-based land reform pilot project that distributed land owned by large corporate estates to groups of poor farmers. The program, modeled on Brazil’s market-based approach to land reform, provided the groups land rights and funds to buy the supplies needed to diversify their farming and increase production. Today, over 15,000 rural Malawian households own land as part of a community and each family’s income has increased by 40 percent. Food security has also improved for these families and for those living in the surrounding communities. To help eliminate poverty, the World Bank recommends increasing land access and tenure for the poor and vulnerable by redistributing rural land, providing ownership rights for squatters on urban public land, removing restrictions on rental land and promoting gender equity by documenting the land rights of women.